Apple’s secrecy is the stuff of legends, and if you’ve ever wondered how Apple went about keeping the iPad a secret prior to it’s launch, this story from BusinessInsider is quite interesting. 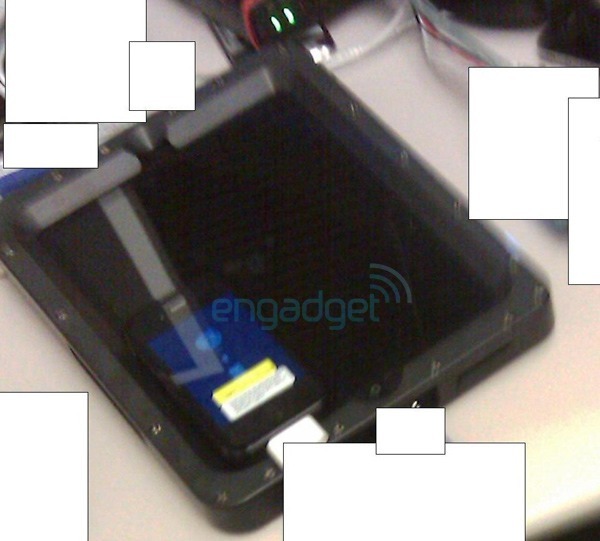 The heavily masked image at the top came from Engadget a few days prior to the official iPad unveiling in January 2010, and is likely an accuruate representation of the custom frame that masked the iPads appearance in the developers tale. This reads like something out of the Skunkworks program, Apple is nuts and I love it! Whats nuts about that? If I were to put thousands of engineers and designers to work hard I too would protect what they’ve done like that. Also in that picture an Iphone 4 before it was out. that was a good leak! It’s not that unusual. I worked for a company that had a license to produce stuff from the LotR films. Before the first film came out, we were working under similar conditions; solid steel door, restricted access control lock, frosted windows (the guys needed daylight), 1 computer off the network to view the CDs sent from the USA. NewLine were really hot on security, particularly with the Balrog, Fell Beast & Shelob. Yeah but it’s okay to leave it at the bar every now and then. My only problem with this is I bet it is actually illegal to collect social security numbers in this way…..Not that Apple would ever get charged for it…. Yeah, there is no way in hell I’m giving my SSN to Apple just to be able to test the iPad early. That’s absurd. « iPhone 5 to be Offered in Black & White, 16GB & 32GB Models?